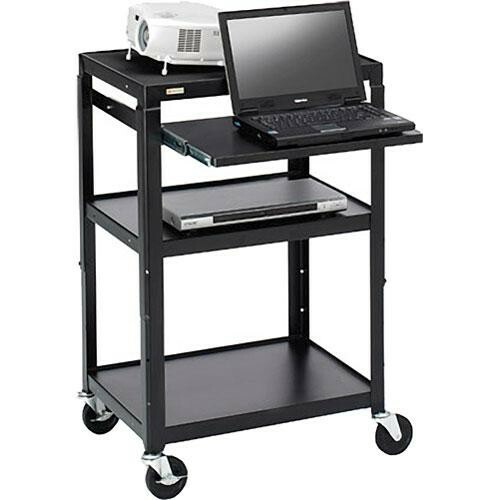 Height-adjustable from 27 - 43"
The Bretford A2642NS-P5 Adjustable AV Cart with Pull-Out Notebook Shelf features a 14"D pull out notebook shelf, and easily adjusts to heights of 27, 31, 35, 39 and 43". The top shelf supports a projector or CRT monitor up to 20" while the open, roomy lower shelves accommodate a DVD player, scanner, speakers, or other AV equipment. Constructed from steel for strength and durability, the A2642NS-P5 has three 20-gauge steel 18" x 24" shelves with a 1/4" lip, and 14-gauge steel legs. The top shelf includes a ribbed rubber mat to keep your equipment from sliding off. The A2642NS-P5 hasa black powder paint finish and comes with 5" mar-resistant black hard rubber stem casters (2 locking) that are load rated for 125 lbs (56.7kg) each. Adjustments 27, 31, 35, 39 and 43"
Box Dimensions (LxWxH) 36.6 x 27.0 x 20.0"